Its good, but i would like a bit Icon Effect on this! Great feature. Very, very useful! Looks cool. Hopefully they will bring back pages to the tab page through. 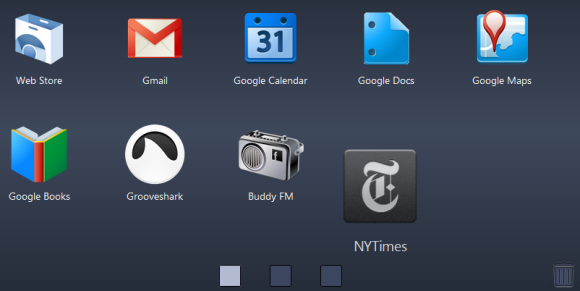 Could this be the first part of the merge between Android and Chrome. After all I have forgotten the amount of times Google themselves have said chrome is for Keyboard devices and not tablets and yet they go and developed a touch interface for chrome . This interface seem contrary to that statement. But we also know in the long term Google plans to merge the two OSes I do wonder if this is the beginning of that long term goal. Eric Schmidt said that Android is for touch screens and Chrome is for devices with Keybaords but now Larry is in charge ! When is a chrome browser coming out for Android? When is a chrome browser coming out for Android?" Honeycomb looks a lot like it Chrome, at least heavily base on chrome. I guesting much of the code is the same save for the Hardware rendering elements. Well I'll be happy to see chrome browser for my android device. when it will come? Any news on Chrome for Andriod? ?